London and Geneva 17th April: A new report by Earth Security Group offers an innovation framework for CEOs of global agri-business companies to navigate a more complex set of systemic social and environmental pressures around the world. The report will help companies to implement the Principles for Responsible Investment in Agriculture and Food Systems (CFS-RAI), developed by the Committee on World Food Security, and the UN Sustainable Development Goals (SDGs), in their strategy, business model development, and impact assessments. At a time when investors and global clients are increasing the scrutiny of agri-businesses for their impact on sustainable development, Earth Security’s report, developed in collaboration with the World Business Council for Sustainable Development (WBCSD) and the Global Agri-business Alliance (GAA), and supported by the Swiss Agency for Development and Cooperation (SDC); guides companies to implement the CFS-RAI principles and SDGs in the way they do business. The report recommends key areas for greater collaboration of agri-businesses on critical issues such as smallholder development, youth participation in agriculture, accountability for the sector’s negative impacts, and land tenure security. 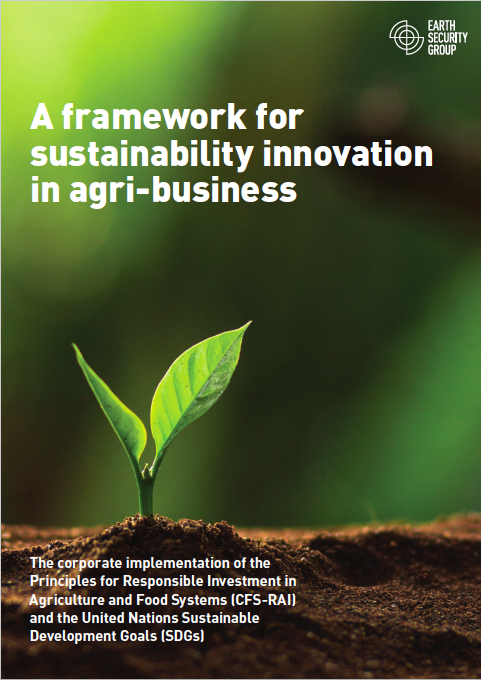 The report shows how the CFS-RAI principles, developed through an extensive consultation of stakeholders and selected ‘SDG targets’ provide the basis to measure, monitor and communicate corporate progress on issues that are of vital interest to society.